I saw on your website that you tried to call us this week to buy Visa and were on hold for 20 minutes at the branch before being transferred. I am sorry for the delay on hold. Can you let me know the location of your branch? We are very focused on excellent customer service and I want to look into this long hold time. Honestly, I didn’t expect anybody from Scottrade to contact me for that minor issue. In my reply to Chris, I told him that my statement (”had to wait nearly 20 minutes before my called was transferred to Scottrade’s national service center instead being answered by brokers at my local office”) wasn’t very accurate. I wasn’t really put on hold for the entire 20 minutes. Here’s what happened on March 19. I called my local Scottrade office a little after 9:30 am. However, the phone rang much longer than usual and nobody picked it up and I didn’t get a voice message either. So I hang up and dialed again. Still the same. I hang up and waited a few minutes before trying again and still nobody answered the phone. I called my local office quite often in the past and even when everybody was busy, I always got the voice message very quickly so I knew I needed to wait, but not on March 19th. Eventually I waited until I was told that my call will be transferred to Scottrade’s national service center during peak hours or in the weekend. After a few more minutes, I spoke to a broker and that was about 10:00 am. I know March 19 was a busy day because of Visa’s IPO, but somehow the voice message I usually get didn’t work and that caused the confusion as I wasn’t sure what happened. If I had waited a little longer instead of dialing and waiting many times, I could have reached a CSR earlier. I manage public relations for Scottrade and I wanted to follow up with you on your correspondence with Chris and make sure you were satisfied. When you call your branch, the phone rings about five times and then rolls over to our Service Center here in St. Louis if no one is able to answer the call – either because they are assisting customers in the branch or are on the phone. Typically, however, they are able to answer within two to three rings. We’re not sure what happened in your particular the branch the day you called. We do know it was an unusually busy day due to the Visa IPO, but the calls still should have rolled over promptly. We appreciate being alerted to a potential issue and are glad that we had a chance to investigate it. I have been a Scottrade customer for more than five year, having our brokerage account and IRA accounts with the firm since 2002. Though I have opened several brokerage accounts with other firms in the past couple of years, Scottrade remains our primary broker for reasons I have explained before. I am quite happy with Scottrade, though its commission wasn’t the cheapest. On the other hand, I also have an account with Zecco, which offers $0 commission for stock trading that nobody can beat, but its customer service is just terrible. I have complained at here several times in the past about my experience with them, but nobody ever contacted me for the issues I, as well as other customers, encountered when dealing with Zecco. I guess that’s the reason why I won’t jump from Scottrade to Zecco. Enjoy your commission free trades. Zecco’s Custom Service is simply awful, I agree, but the one time I chose to contact them via phone instead of e-mail things actually got done as opposed to a 24-hour wait and a generic response. One particular CS individual at Zecco helped to resolve my problem after the phone call with promptly responded e-mails and actual actions taken. Try initiating your next issue with Zecco by phone and see how things progress. I am very satisfied with their resolution of an issue that occurred. Are you sure they didn’t treat you well because they found out you had a blog? Every other account I read is about their terrible customer service. For me, I find that it’s impossible to get any type of service from scottrade without physically going to the local branch and waiting. Ugh, what a waste of time. 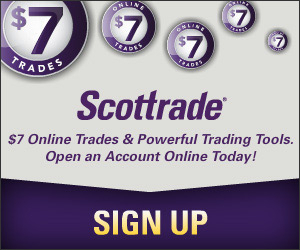 Jen: I have been using Scottrade well before I started this blog and I don’t remember they were more difficult to deal with than other brokers/banks. What you said could be true. But the things is I have written about my experience with any other brokers, banks, and credit card companies, and almost none of them had contacted me for my problems. Just from this, I think it shows at least that Scottrade cares their image and wants to improve their service. I didn’t get the same treatment from others, even though I had bigger problem with them.